If you haven’t noticed by now, it’s Saturday and I usually post on Tuesday. That is happening this week because I usually write my article here at Redleg Nation on Monday afternoon or Monday evening, but this past Monday I was driving across the country from Pensacola to Cincinnati after spending five days in Florida with the Double-A Blue Wahoos. 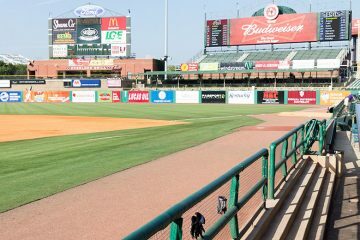 Each year for the last five years I have made a trip to the Double-A affiliate for the Reds to watch the team in action for a full series. Two years were spent in Zebulon, North Carolina watching the Mudcats and the last three years in Pensacola with the Blue Wahoos. This year did not get off to a good start. I had planned to take in a full five game series in order to see each starting pitcher. Unfortunately I didn’t make it down in time that first day due to a six hour traffic jam where there was a series of horrendous wrecks that wound up causing a fire and then one almost immediately after at the same scene that even worse, caused the loss of life of a volunteer fireman. After getting back on the road for about two hours, things were going well and I thought that if I made good time I could only miss the first two innings of the game. Then my rental car began telling me I needed an oil change, so I pulled over and called the car company. They told me it doesn’t need an oil change and that it just had one 800 miles ago and that someone just forgot to reset the computer and to continue on my way. Oops. Less than a quarter mile later the car started spewing white smoke out of the exhaust, so I pulled back over and called back. The lady on the other end of the roadside assistance had me drive half a mile down the road to an oil change place to get the oil changed. I got there and they were expecting me, but it still took about 35 minutes to get the car in as they had other customers. Eventually my car was ready to go and they sent me on my way and said everything was fine. I pulled out of the shop and turned onto the side road and things seemed to be going smooth. No smoke. Then I turned onto the main road where it’s 45 MPH. Once pushed to 2500 RPM’s the car began to sputter and wouldn’t go over 25 MPH. So I pulled back over and called roadside assistance. After gathering my location they said they would call around to find the closest location with a similar car for me to trade out. After about 10 minutes I got the call back that the airport, 45 minutes away, was the closest option unless I wanted a truck. Given that I still had over 1000 miles to drive in that thing, I wanted all of the gas mileage that I could get. So they told me it would be about 2-3 hours before they could get someone to me with a car, or that I could wait about an hour to get a ride with a tow truck drive to the airport. I chose the latter to try and do anything to save even a little bit of time. The driver showed up earlier than expected and we got moving pretty quickly. Once at the airport though, things slowed down and it took me nearly an hour to get into a car and drive off once I arrived there. Sadly, I didn’t make it into Pensacola until after the game was over that first night and I missed out on seeing Ben Lively that night. Once I actually arrived in Pensacola, things went great. I was granted media access while on the trip, so each day I showed up in the early afternoon to get some work done and then go down to the field level to watch bullpen sessions and batting practice each day. I had a chance to talk with some players before games and during the games I was able to have some conversations with the guys charting the game (the next days starting pitcher). During batting practice one thing was very evident. Juan Duran has an insane amount of power. He would miss-hit balls that would clear the wall. He would take easy swings and the ball would clear the wall. Then he would really swing and the ball would just explode off of his bat unlike anyone else on that team, and unlike anyone else in the Reds system currently. It’s a rare thing to come across. Duran would even show off the power in the games, hitting two home runs in the four game span that I was there, including this one. While I have seen Yorman Rodriguez play since he was 16-years-old (he just turned 22 yesterday), he’s still one of those guys that when I watch him over a few game span, he just has “it”. I hate saying things like that, because I like to quantify things, but I’m just a believer that this guy is going to be darn good one day. There are things he still needs to work on, but his tools are just too much there for me to not believe in him. While he isn’t in the same class as Duran on miss-hitting the baseball over fences and beyond, the ball carries off of his bat even when he misses it. The power is going to come for him one of these days and when it does, it will be fun to watch. Look at the video below. This is a 21-year-old going to the opposite field gap on a liner off of the wall in a stadium where the ball simply doesn’t travel at all to right field (in 70 games in the 2013 season played in that stadium there were NINE home runs hit by both teams in the stadium to right field. In the 70 road games Pensacola played in, the two teams involved hit 31 home runs to right field). The top hitting prospect on the team of course is Jesse Winker. Unfortunately he is injured and is unable to play. That didn’t stop me from sitting down and talking with him briefly about his injury, how it happened and where he is at in his recovery as well as future plans this season. Not exactly baseball related, but one of the cooler things of the trip took place around catcher Ross Perez, who has since been promoted to Triple-A Louisville. Earlier this year a very cool thing happened for Perez when he was forced to catch the ceremonial first pitch of a game that he was supposed to start, which never happens. There was a good reason for it. His father had come in from Venezuela and was throwing out the pitch, unknown to the younger Perez at the time. It was the first time his father had ever seen him play as a professional in person. As if one first pitch story wasn’t good enough for Perez, this time he had the surprise for someone else. His girlfriend threw out the first pitch and as he walked towards her to meet in the middle, he dropped to a knee and opened up a baseball with a ring inside to propose to her. Perez talked to his teammates before the game and asked if they would agree to wear their normally only on Sunday alternate pink jerseys so the pictures would look better. They turned out well. On the field, I had never seen Perez play in person. The Reds picked him up as a minor league free agent in the offseason from the Diamondbacks and he’s had an outstanding season, hitting .328/.389/.453 on the season with more walks than strikeouts. While he only played two of the games while I was in town, it’s also why I show up early and watch batting practice. As noted, he walks more than he strikes out, but he also showed some good bat speed. I don’t think there’s a bunch of power in there, but he could develop into a double digit home run guy with good all around skills at the plate. Behind the plate is something that I haven’t gone back and looked at on the video yet, so I don’t want to get into that one too much at this point. The skills with the bat though stood out. Enough about the hitting. Let’s talk about the pitching. The starting rotation in Pensacola includes Ben Lively, Daniel Corcino, Jon Moscot, Robert Stephenson and Michael Lorenzen. Talk about a stacked rotation. As a whole, the guys didn’t have the best week while I was there as I missed Lively, and Stephenson and Lorenzen both ran into problems. Of course, I don’t care as much about the results as I do the process and how things project moving forward and on that front, there was a lot to like. Daniel Corcino has been about as inconsistent as possible over the last three seasons. He will have a good game and then two or three bad ones, then put together a string of a few good ones and then just completely fall apart. I happened to be around for arguably his best start of the year. His velocity wasn’t where it used to be in this game, though I later asked around and his velocity varies largely from game-to-game. That’s a clear sign that he’s struggling to repeat his mechanics, which is something that’s plagued him for a while now and why he is so inconsistent both in production and with his ability to throw strikes. On this night, Corcino was able to throw strikes and he threw a bunch. The right hander threw eight shutout innings with just one walk and he struck out six. He was locating the ball well and was moving the ball all around the zone, changing the eye level of the hitters all night long. Jon Moscot, like Corcino, put on a very strong performance. He threw seven shutout innings without a walk and with four strikeouts. He looked pretty similar to when I saw him last season around the same time of the year (I saw him a year and a day earlier – I looked it up). Moscot doesn’t jump out at you from a stuff standpoint. His fastball isn’t blazing, the breaking balls aren’t ones that will tear ACL’s and the change up doesn’t drop completely off of the table. But all four of his pitches are good ones and he knows when to use them and where to use them. I hate saying that guys are pitchers, because when I hear others say things like that I usually read it as “they don’t have stuff to get big leaguers out”, but Moscot is a pitcher. He’s got some stuff to work with, but he also knows how to use it. Robert Stephenson had a day he’d probably like to forget. The prized right hander didn’t make it out of the third inning, allowing five runs on nine hits and two walks with two strikeouts. There was some good news in there though. The stuff is still there. The fastball, the curveball, the change up, all pitches that were good or better offerings. Where Stephenson had his struggles was locating the pitches. The fastball could be thrown in the zone, but not where he wanted it to be in the zone. The offspeed stuff would often miss the zone and it made it a little bit easier for guys to wait for the fastball, making even a very good fastball more hittable. It’s been a rough year for Stephenson, and I think it’s fair to say that in some parts of his game he has taken a step backwards, but he’s still just 21-years-old and the number of pitchers in Double-A or Triple-A that are his age or younger can still be counted on my own fingers. He has some work to do and some things to figure out, but on a pure stuff basis, there are still very few pitchers in the minor leagues that can match him. Speaking of guys who can match Stephenson’s stuff, while I wouldn’t line it up directly, Michael Lorenzen sure isn’t too far off. Like Stephenson, he didn’t have a good day while I was roaming around the ballpark, giving up six runs in three innings with two walks, hitting a batter and not striking out a hitter. Of course Lorenzen is brand new to this starting pitching thing and after throwing just over 60 innings last season between college and professional baseball he is now at 108.2 innings. What stood out to me was his fastball. While his velocity is above-average to plus at the top end, it was the sinking action that came with the pitch that was a difference maker in my eyes. While I didn’t see Lorenzen on his best day, far from it actually, it was still quite clear how far he has come since last season. While I didn’t do much outside of working in the hotel room (well, when I could given just how slow the internet was, you know, when it was working) or working at the stadium, I did get a chance to hit up two local restaurants that if you are ever in Pensacola, you should be sure to check out. The first is a local wood fired pizza place that is owned by the parents of Chicago Cubs super prospect Addison Russell (the main part of the Jeff Samardzija trade). If you like pizza, you need to take the time to go to The Tuscan Oven. The staff there is great, but the pizza is even better. I’ve been all three years that I’ve made the trip to Pensacola and it has never disappointed. The other place that you should be sure to check out, if you are into burgers at all, is called The Tin Cow. They probably had the best burger I’ve ever eaten in my life. The service wasn’t exactly the best I’ve ever experienced, but the burger was worth it even if the fries weren’t so good. 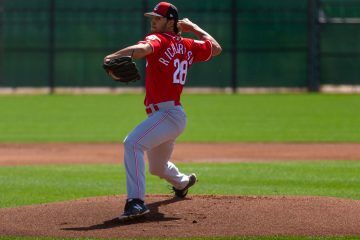 As a side note, if you made it through all 2400 words above and you have a few extra minutes, head on over to RedsMinorLeagues.com and check out the new layout for the site. It’s been a long time coming for a new look and I finally got around to making it happen. Doug Gray is the owner RedsMinorLeagues.com, writes here at Redleg Nation, and as you guessed it, passionate about the Cincinnati Reds and baseball in general. He's been writing about baseball since 2006. You can keep tabs with him on twitter @dougdirt24. He can also be reached via email here. Fantastic report Doug! Pensacola is my hometown when I am in the states. Great ballpark, great city, and a great baseball town. Go Wahoos!!!!!!! Doug – Just some words of encouragement from an eager RLN reader. A great report. Bummer on the rental car but otherwise sounds like a great trip. Here’s hoping some of these prospects figure out how to turn tools and talent into on field success. Thank you for this in depth update! Make a stink with the rental car company and maybe they will comp you a free rental. I was able to get some free time out of it. I didn’t have to ask, they just took care of it. My family vacations in Gulf Shores, Alabama every year. We were so happy when we found out the Reds AA team would be playing in Pensacola (less than an hour away). We even got Billy Hamilton’s autograph. It’s a very nice experience all around. Nice stuff with good information. Corcino and Moscot both had good outings the week before in Tennessee. They seem to be on a nice roll now. It’d be a good way for both to end the season. Juan Duran does have some power. He hit 2 HR’s in the Tennessee series. He’s a big guy at 6’7″. If he could put a little more beef on his frame without negatively impacting his hitting, watch out. YorRod just had a bad game at the plate the night he started, but was impressive in the OF as he showed off his great arm. Given time, it’ll be interesting watching these two along with Winker and Ervin develope. Next year it is a plan to go to Pensacola. But I’m going to hit the white sand beaches in the daytime, not the hotel internet. Then have baseball in the evening. Like your new digs at your minor league site. One of the players recommended Casino Beach while I was in town. It’s on one of the islands off of the mainland, but it’s supposedly a very nice one to check out. So give it a look when you are planning your trip.